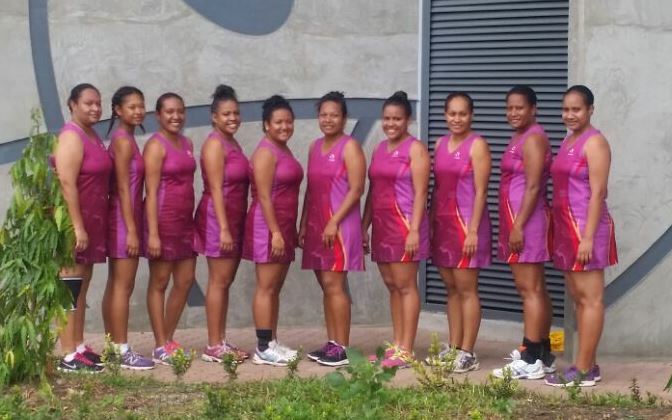 Air Niugini will be up against Theodist in the Division 2 grand final of the Private Companies Netball Competition at the Rita Flynn Indoor complex this Sunday, 17th April 2016. The PX girls beat Theodist two weeks ago in a thriller match by one point, 25-24 to secure a spot in the grand final. Theodist went on to play Deloittes last weekend and came out winner, hence challenging the PX girls again this Sunday to see who takes home the shield. Air Niugini was the minor premier of Division 2 and the girls now look forward to taking on Theodist in the grand final. Early this month, the PX team received new set of uniforms from the airline’s Customers and Markets Department. The ladies were all smiles when receiving uniforms from ANG Marketing Manager, Ms Nori Maniana who congratulated them for making it to the grand final and for promoting the company’s brand in sports. Air Niugini Team Coach and player, Ms Christabella Amona thanked the company for sponsoring their team this year. She said the girls have committed themselves to ensure they remain in the competition and make it to the grand final, adding that the new uniforms only boost their morale to play even harder. “ We acknowledge Air Niugini for the support and will do our best in the grand final to win the game. We would also like to encourage all PX staff and families to come along and support us.” Ms Amona said. Air Niugini fielded two teams in the competition this year including division 2 and 3 respectively. The Port Moresby Private Netball competition comprised of 73 teams, challenging each other in 11 divisions. The participants represent various private companies operating in the nation’s capital.